I don’t like people who run away when things get tough. I don’t run (unless it’s from chainsaws or zombies) and I don’t give up until all other options have been exhausted. 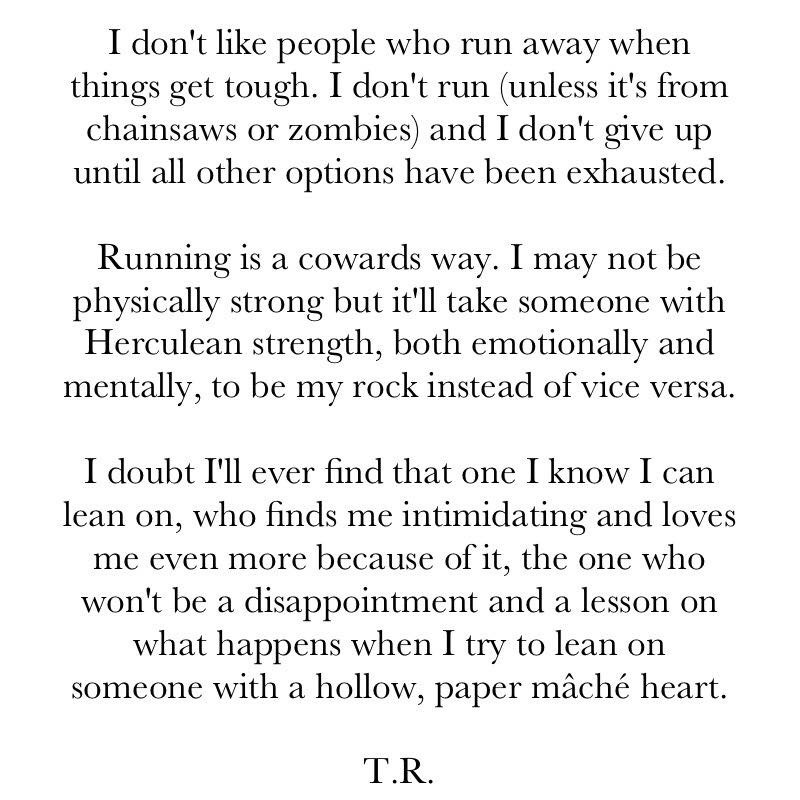 Running is a cowards way. I may not be physically strong but it’ll take someone with Herculean strength, both emotionally and mentally, to be my rock instead of vice versa. I doubt I’ll ever find that one person I know I can lean on, the one who finds me intimidating and loves me even more because of it. The one who won’t be a disappointment and a lesson on what happens when I try to lean on someone with a hollow, paper mâché heart. I never give up unless I am absolutely forced to….and when I do, I walk away for good. I despise cowards….having been around bullies for my entire life, I finally realized that all bullies are cowards. Bullies and cowards are no longer allowed in my life. That’s not giving up…that’s being smart.